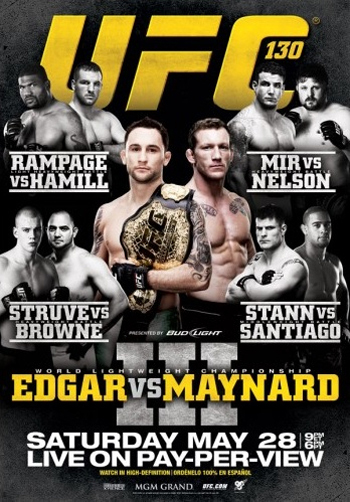 “UFC 130: Edgar vs. Maynard III” takes place May 28th and features a star-studded cast. If you don’t believe us, the planet’s biggest MMA promotion has released the official event poster as proof. The billboard features the main card’s 10 stars. Frankie Edgar will defend his lightweight title against Gray Maynard in the night’s featured attraction. A critical light heavyweight affair between former champion Quinton “Rampage” Jackson and Matt Hamill will open for the 155-pounders. Prior heavyweight title holder Frank Mir will also face “The Ultimate Fighter 10” winner Roy Nelson inside the MGM Grand Garden Arena in Las Vegas, Nevada.